Doctoral candidate Michelle Pierre is working to create a biosensor that can pre-diagnose diabetes, and to develop a form of neonatal testing that can detect diabetes in premature babies using only a small sample of blood. As a single mother, however, juggling graduate school and research while raising two daughters is not easy; but taking part in the Bridge to the Doctorate program at FIU made it possible for Pierre to do both. The Bridge to the Doctorate (BD) program, a fellowship program funded by the National Science Foundation, helps minorities pursue graduate degrees in STEM (science, technology, engineering and math) fields. It offers a network of support and mentorship to students, covers full tuition and fees and provides a $30,000 annual stipend for the first two years to offset living costs while performing research. The program’s goal is to change the culture of graduate education in STEM, where, according to University Graduate School Associate Dean Sonja Montas-Hunter, only 5 percent of doctorates are awarded to minority students. The reason for this is lack of encouragement to pursue STEM at the undergraduate level. BD places an emphasis on support networks and counseling from staff and faculty to guide students through their graduate education. Collaboration not only between students and professors, but also among students in the program, is a necessity. While students work on state-of-the-art research projects with faculty mentors, they also meet with each other regularly to discuss their research and bounce ideas off one another. Members of the Bridge to the Doctorate program’s current cohort celebrated with faculty mentors and university leaders at a reception with President Rosenberg. Each cohort at FIU consists of 17 students, and the current cohort has 11 different majors, so the collaboration among students in the program offers them a chance to see how other fields of STEM research might intersect with their own. BD students are also encouraged to get involved in the community through a K-12 outreach program, as well as campus undergraduate and graduate life. Other benefits of the BD program include access to competitive funding for up to five years after the first two years of study are completed, professional development workshops, travel funding for professional meetings and more. To apply for BD, students must have participated in a Louis Stokes Alliance for Minority Participation (LSAMP) program, a pipeline program for BD, during their undergraduate studies. According to BD co-director and Chair of Electrical and Computer Engineering Shekhar Bhansali, the major pitfall for many students applying to BD is that they procrastinate as undergrads, and don’t leave themselves enough time to take part in the LSAMP program. As a result, they lose the opportunity to have their graduate research and studies funded by BD. 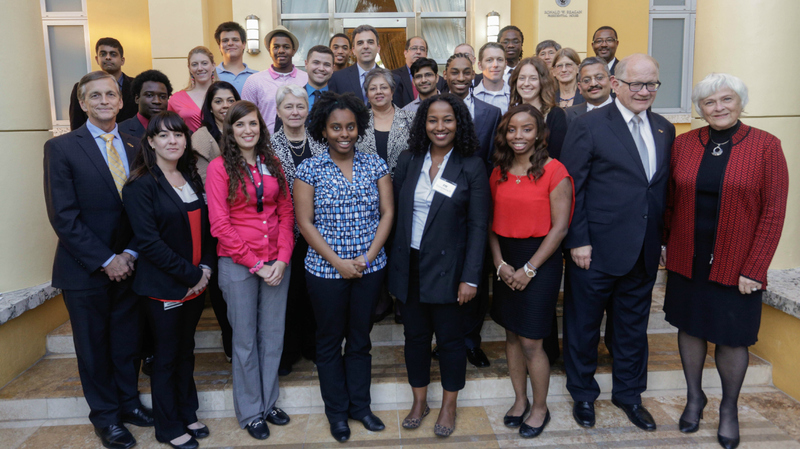 Students who may want to considering pursuing a doctorate would do well to reach out to mentors in their undergraduate years, and current undergraduate students at FIU can start to get involved in the pipeline programs now, as the university is a member of the Florida-Georgia LSAMP alliance. “You have to have that foresight to see what the possibilities are, and start working at them during the early years,” Bhansali said. For more information on how to apply for the Bridge to the Doctorate program, click here.